Rajiv Mohabir: Congratulations on publishing your first book! It is quite remarkable in its unflinching look at gender inequality, cultural inheritances, and legacies of trauma. Shivanee Ramlochan: Thank you, dear Rajiv. I’m immensely grateful for the reality of your two books in the world, too. How they have deepened the well of queerness for me, charged with survival, desire, and the eradication of the Indo-Caribbean as exotic. I prize them, and praise them. Rajiv Mohabir: Apart from the richness of imagery there is a diverse world that the speaker inhabits, a layering of colonial and migratory histories at play. Can you speak to your speaker’s identity in a historically and culturally complex context of Trinidad? 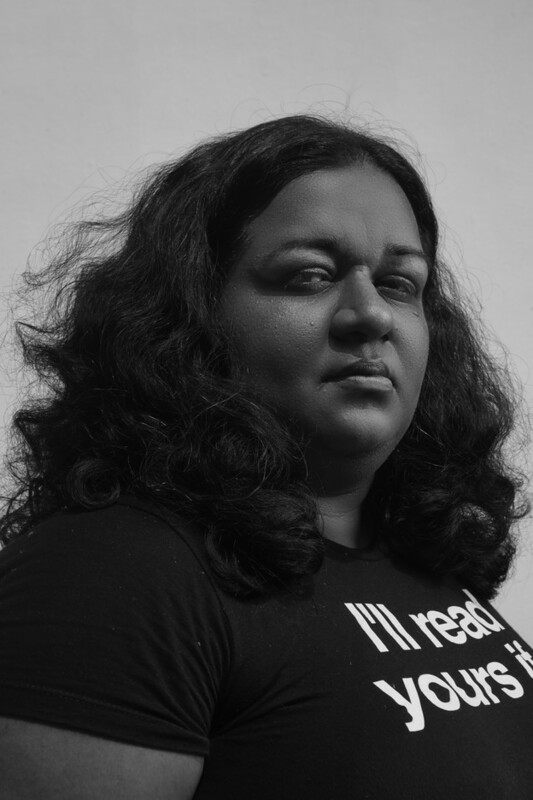 Shivanee Ramlochan: Everyone Knows I Am a Haunting speaks in ways I have wished I would, or could, all my life. To insist that the poems do this anti-muzzling work, I set them with attention to the irregular, cathartic rhythms of my life, and the lives of others, in Trinidad. If I insist the poems do anything, I must insist it first, and without excuses, of myself. What did I find, then, in my own self-insistence? I found that the forces muzzling me — patriarchy; heteronormativity; the hypocrisy of insular, male-ordered Hindu societies and subgroups — were and are the very same forces that compel me to write poems. Creative persistence in Trinidad is more like a dance than a martial ingress; you learn to dismantle and subvert in your Sunday best, for the sake of your own survival. The insistence in this work is perhaps particularly Trinidadian in that way: it does not seek the set-jawed, head-on audacity of the literary, or cultural, metropole, which often demands truths be spoken without apology or fear in the public square. This work I do is often afraid, will deny itself for its own survival, will lie and live to fight another day. I cannot imagine anything more Trinidadian than that. Rajiv Mohabir: Personing the pages are characters like abortionists’ daughters, queer men, duennes, and soucouyants. What kind of religious traditions have shaped the architecture of your poems in this collection? Do they reflect personal or community beliefs that you are responding to through your work? Shivanee Ramlochan: My mother is Roman Catholic, the product of an Indo-Caribbean family subject to, and (largely) happily resident in, Christian proselytization. My father’s people are Hindu. With neither parent didactic in their approach to household gods, I found myself positioned reflectively in the grey space between both faiths in my girlhood. I was drawn to but did not understand Hinduism; I understood more of, but was not drawn to, Christianity or any of its chambers. This faithful/faithless doubt, rapture, and curiosity I’ve grappled with for two and a half decades has seeped into everything I do, I imagine. All Souls’ is as native to some of the intention and sculpture of this work as is Divali. Across both faiths, I have absorbed markers of ritual like tattoos, and several of these sentiments show up in the poems: that the preparation of one’s dead for burial or burning is an imperative responsibility of the adult child; that feasting and fasting are both ways to converse with the divine; that song transports us to the weald of the God-Beloved. Perhaps the most important thing I’ve learned from my religious hybridity is that no faith has ever fully given me a home. In these poems, part of what I strive to teach myself is the charity of turning my face from God, to grant her some respite from the endless labour of saving and setting on fire. Rajiv Mohabir: Your speaker plays with a Hindu identity, how has a heritage of indentured labor shaped or not shaped your sense poetics? Are you inspired or do you revile any particular moments of this history? Shivanee Ramlochan: I am only now embarking on a committed exploration of my family’s personal history of indentured labour. I am journeying in earnest on a path I suspect I have wanted to take all my life: that of an archival fidelity to my Indianness, my identity as shaped by kala pani, canefield work, cow farm and rumshop origins. It humbles me that some of this nascent intention emerges in Haunting; those poems in the collection that directly engage indentureship were the hardest to compose. They came from me willingly but at great cost. I am eager to pay much more for future work. I have resisted this direct engagement with my coolitude because there is nowhere to hide in it. As I enter my thirties in earnest, I think it’s time to stop hiding. Rajiv Mohabir: What about the occult or bhoots and hauntings? What draws you to it? Shivanee Ramlochan: I have always had a hard time regarding death as final. The clearest memory of death from my childhood is my aja’s. He died when I was nine, and he died while playing the harmonium during a puja. I wasn’t there, but I have often thought of the divine embracing him as the last notes of bhajan pealed from my grandfather’s hands. Dead but not done, I think a part of me is always listening for my grandfather’s music. I invite the past into me like this, reminding myself that it is always present, that the reality of all the dead in me equips me better to be of service to the living. The occult is as ordinary to me as everyday tea, as a pair of polished boots in a hallway, or a tethered goat in the countryside. Ordinary as an act of devoted vigilance. Ordinary as the ghost in my orhni. Ordinary as breath and what comes after it. Rajiv Mohabir: Who, writers or artists, have been your gurus? How long have you been writing this book before you published it? Shivanee Ramlochan: Jean Rhys has a hand in this book, as does Vahni Capildeo, as does Gaiutra Bahadur, whose alchemical Coolie Woman is the first publication that made me weep astonished tears at seeing myself reflected in its pages, me and the long line of women who have birthed and brought me here. I’ve been writing these poems for the eyes of my mother, and I will always be writing for my mother, my first guru. Some of this work has been making and remaking itself for a decade. I still wake up in the middle of the night with the sharp blade of one, or many, of these poems between my teeth, worrying: Did I get it right? The only way I can return to sleep is to remind myself: never perfectly right, but true. I told it as true as I know, which in the final analysis has very little to do with fidelity to biography and scientific fact, but to a distinct detection of the muscular intent, vulnerable precision, and exposed heart of every poem. Rajiv Mohabir: Writing about family members and personal stories can be fraught. How did you decide what to include about your own family, your Aji and Nani? Shivanee Ramlochan: At great cost. My grandmothers appear here as waypoints between the perfectly verifiable and the unsettlingly speculative. No inventions I have made in their names have been easy, nor would I wish it thus … and everything that is “true” about their appearance in the work gives me a tremendous, almost terrifying internal shock when I see or hear the poems being read, when I read them to myself. It is as though the writing of them has put some of my internal organs on full display. I relish being caught off-guard by the sight and utterance of them. It tells me the cost was necessary, and to pay anything less would be an act of dishonour and shame. Rajiv Mohabir: What other writing projects are you currently working on? Can you give us a sneak peek at any particular arcs and bends you are obsessing over? With each new poem, I might be moving away from the sort of verse that is likely to get me invited to polite functions, but this suits me. Several there are liable to think I’m a fat, queer, troublemaking liberal heathen, the antithesis of a good Indian girl. I’d rather cause trouble in the bush, in the village of Las Lomas where I grew up, writing poems for which I do not, and need not, and will not, apologize. I haven’t been a good beti for a very long time.